The effects of orally-administered myo-inositol have been compared with those of an aldose reductase inhibitor on acute neurological defects in experimentally diabetic rats. 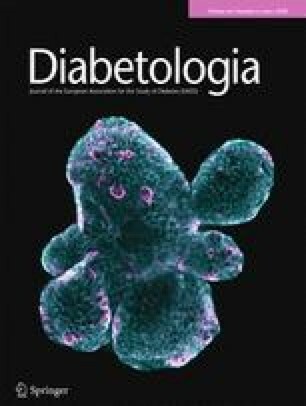 Three groups of streptozotocin-treated diabetic rats (50mg/kg, IP) together with three groups of age-matched controls (saline, IP) were compared. One pair of groups (control and diabetic) were untreated for 3 weeks, another pair of groups received daily oral myo-inositol (667 mg/kg) and the third pair received an aldose reductase inhibitor (ICI 105552; 50 mg·kg-1·day-1, orally). The untreated diabetic group showed statistically significant deficits in accumulation, proximal to 24 h sciatic nerve constrictions, of choline acetyltransferase activity by comparison with untreated controls (2.8±0.4 versus 5.1±0.4nmol acetylcholine ·h-1·nerve-1; p<0.001). The untreated diabetic rats also showed a fall in motor nerve conduction velocity of 6.2±0.7 m/s which was statistically significant (p<0.001). Treatment of the diabetic group with myo-inositol prevented the development of both defects of axonal transport and conduction velocity; both measurements were similar to those of the myo-inositol treated control rats. Likewise the diabetic rats which received aldose reductase inhibitor showed prevention of both defects. Nerves from untreated diabetic rats showed marked sorbitol accumulation and a statistically significant reduction in myo inositol content by comparison with the untreated controls (sorbitol, 1.56 ±0.22 versus 0.8±0.01 and myo-inositol, 1.47±0.10 versus 2.3±0.10 nmol/mg; p<0.001). Treatment of the diabetic rats with myo-inositol elevated the myo-inositol levels in nerve (3.05±0.22 nmol/mg) without affecting nerve sorbitol levels. Treatment of diabetic rats with aldose reductase inhibitor also normalised nerve myo-inositol (2.75±0.20 nmol/mg) and reduced nerve sorbitol (0.08±0.01 nmol/mg). These findings are consistent with the suggestion that both treatments prevent the development of the two functional defects by normalising the nerve myo-inositol content.